October 6. 1849 was a date still to be remembered and commemorated in Hungary. 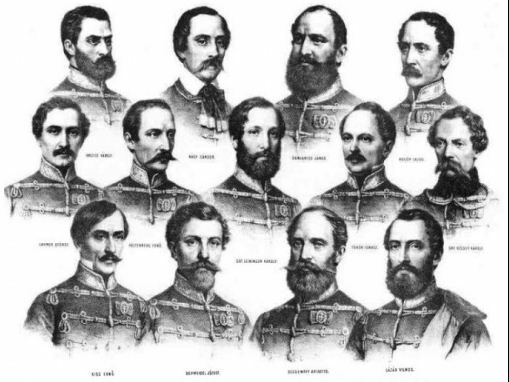 On that day 13 of the generals from the 1848-1849 revolution in Hungary against the Habsburgs were executed in Arad (in Romania today). At the same day Count Lajos Batthyány was executed as well, the first Hungarian Prime Minister. Today a square near the Liberty Square has an “eternal light” named after him (located at the place where Count Lajos Batthyány was killed). Legend has it that while the revolutionary leaders were being executed, Austrian generals were drinking beer and arrogantly clinking their beer mugs together in celebration of Hungary's defeat. Hungarians thus vowed never to clink glasses while drinking beer for 150 years thereafter. Those years have passed away, but the people still don’t clink their mugs in Hungary.